From the band Christafari comes Avion Blackman with a sound described as a breezy blend of organic roots reggae with echoes of folk, worship, World, soca, R&B and neo-soul. This award-winning artist is currently on a extensive world tour in promotion of her second album, "Sweet Life." It's the Wailers meet Sade with an urban flare! With stunning lyrical and vocal sincerity, Avion brings forth emotional songs steeped in ethnic textures pleasing to the ears and satisfying to the soul. "Swimming with alligators sounds a lot more dangerous than it really is," said Avion (while twisting her dreads and describing her adventurous days as a tomboy living in a tropical rainforest with 17 brothers). Born in the bustling city of San Fernando, Trinidad, Avion lived in luxury as a daughter of the famous calypsonian, Lord Shorty. As a young dreadlocked child, she was very outgoing and began singing on stage in front of massive crowds at the tender age of four. That year, her life drastically changed when on a spiritual quest, her father transplanted his massive family to the jungle. She spent the next twenty years living in the jungle seven rugged miles from the remote Indian village of Piparo. Their home was in a log cabin with no doors or windows, plumbing or electricity and few groceries--but plenty of music. She was home schooled with her brothers and sisters, and her family lived primarily off the land--growing virtually everything that they ate. Their days were filled with Bible studies, intense rehearsals, various tour dates and regular performances for curious visitors. As a child in this modern day Robinson Caruso-like family, Avion loved climbing trees, swinging from vines, fishing, and of course; swimming (with alligators). Avion learned the art of harmony while touring and singing chorus for her father, who took on the name Ras Shorty I after his conversion to Christianity. He was the inventor of Soca, (the pulse of Carnival) and Jamoo music. She learned how to play a number of instruments from many of her 24 brothers and sisters. At the age of fourteen she began playing bass for the family band, "The Love Circle". Her first solo studio recordings were "Oh Why" and "So Free", for The Love Circle's "Children of the Jamoo Journey" release. Years later, she recorded the initial versions of "Sweet Love" (for their "Homegrown" album) and "Heaven Above" (for Lion of Zion's "The Gathering" project). In 2003, she moved to Los Angeles, CA, married Mark Mohr and joined Christafari as the bassist and a vocalist of the group. She became well- known internationally for her ethereal lead vocals on Christafari's "Hiding Place" and "My Sustenance" on the group's critically acclaimed Gravity release. In 2004 Christafari began recording "Reggae Sunday School," a children’s album that features Avion on lead vocals and bass. 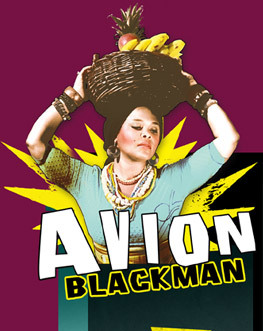 It was during these early recording sessions that Avion and her husband/producer felt inspired to start recording Blackman’s solo album. In January of 2005 the recording began for Avion’s first album "Onyinye" (pronounced owe-neen-yay). "Onyinye" means "gift" in the Nigerian language Igbo. On this heartwarming gospel release, Avion sings tender songs about her love for God and man. It was a family affair as Avion, her husband and other members of the family wrote the infectious tracks that make up this musical masterpiece. The subtle world music influences from this native Trinidadian add spice to this uniquely flavored album. Her vocals caress a captivating blend of folk, jazz, reggae, African, Indian, soca, R&B, jamoo and jungle to craft a meditative musical masterpiece. Avion's songs are stripped back to their essential elements (voice, melody, and meticulously arranged instrumentation); resonating in the heart and in the head long after the last note has fallen silent. In 2006 Avion Blackman took the top honor at the Caribbean Gospel Music Marlin Awards held in Nassau, Bahamas. She was nominated for a total of nine awards. The biggest upset of the night came in the Album of the Year category, which saw Avion from Trinidad winning the evening's highest award for her culturally sensitive masterpiece "Onyinye". Blackman won in a category that featured several heavy reggae and dancehall recordings like On the Shout by DJ Nicholas, Prophetic Fire by Mr. Lynx, His Way by Chevelle Franklyn and Kingdom Ambassador by Stitchie. Blackman was considered by many as the dark horse in the evening's top race as most thought for sure that the Album of the Year would once again go to Jamaica. Avion however proved them wrong, becoming the first non-Jamaican to win in this category. She also won the Marlin Award for Contemporary Female Vocal Performance of the Year for her soft melodic ballad "Marvelous Beauty" and picked up a third Marlin for Packaging of the Year for "Onyinye". In 2007 Christafari bowed with "To The Foundation," the band’s bestselling release to date (GospelReggae.com), Avion's angelic voice and infectious bass-lines are predominant throughout this project. Beyond the gospel reggae scene, Avion lent her voice to an assortment of songs for network television. Her voice can be heard regularly on popular shows such as “General Hospital” and “One Life to Live” on the ABC network and other Disney owned channels. In promotion of "Onyinye" and Christafari's "To The Foundation," Avion and Christafari toured the world, impacting lives through song, one show at a time. They played at Erwin McManus’ Mosaic and Rick Warren’s Purpose Driven Saddleback Church in Southern California--the two of the most influential churches in America (according to CNN). In 2007 they completed a summer tour of the United States, the UK, Sweden, Finland, Germany, Ireland, the Netherlands and Denmark. They played in virtually every major festival including Notting Hill Carnival, Foundation Fest, Creation Fest, Greenbelt, Frizon, Gavle City Fest, Wildfire, Flevo Festival, Gouda Fest, Glow Fest and the Tara Festival. Later in 2007, Avion and Christafari did their first major tour of Brazil, where they hit eight major cities. In February of 2008 they were invited back to Brazil to perform in front of 80,000 fans! In 2008 Avion released her highly anticipated sophomore project, “Sweet Life.” This time around this staple member of the group Christafari paid tribute to her Caribbean heritage with an offering that’s decidedly more reggae. On this project Avion’s soothing songs on love and relationships are truly inspirational and brimming with honesty. Avion's smile and spirit shine through her music as she sings sunny songs of hope and faith over reggae infused soulful ballads. This year alone Avion is performing 100 shows in 25 countries in promotion of the album.